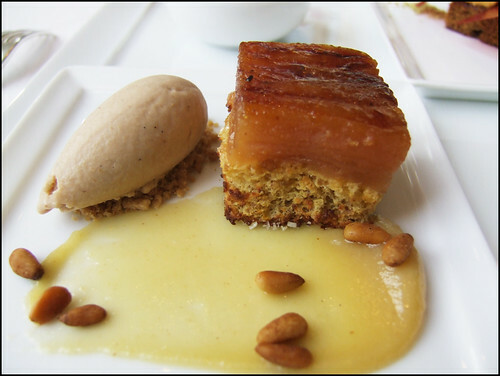 The Wandering Eater recently ate at Jean Georges and her meal is similar to my report below. The dishes don’t change much so older reports can be just as reliable when planning. The amuse bouches, Sunchoke & Cranberry, Shitake, and Salmon Belly, laid the blueprint for the meal – sharp tastes with an emphasis on textures. 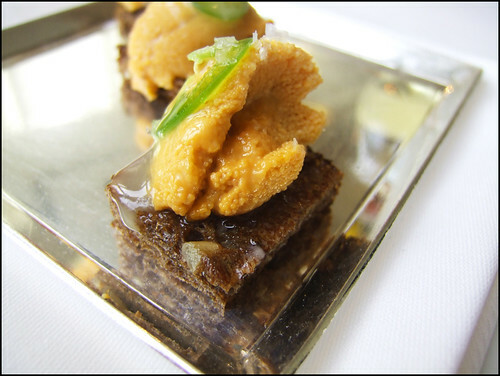 Santa Barbara Sea Urchin, Black Bread, Jalapeno, and Yuzu began the meal with a forceful punch. The flavors were intense, seemingly bouncing around without concern for integration, but they melded together with each bite. The yuzu and jalapeno took turns dominating the tastes but both gave way to the urchin’s lasting sea flavor at the end. 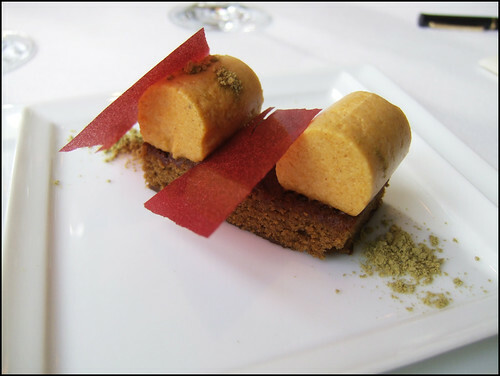 As jarring as the tastes, the textures of the dish played as prominent of a role – the crisp jalapeno, the transformation of the bread as you chew it, and the pervasive creamy uni. Very Good. Sea Trout Sashimi Draped in Trout Eggs, Lemon, Dill, and Horseradish continued the full-blown taste and texture themes. The sequence of silky fish, popping fish eggs, and (I believe) crunchy skin lit up your mouth as much as the powerful tastes. And powerful they were. Blindly sticking your fork into the bowl would yield a completely unbalanced proportion of horseradish to lemon. After experimenting and adjusting, a powerful, but balanced, combination emerged where each ingredient managed to complement each other. Very Good. 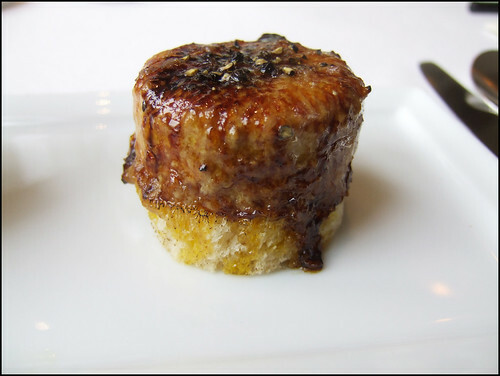 The Foie Gras Brulee with Sour Cherry-Yuzu Marmalade was absolutely stunning – it will make it into 2008′s list of great dishes. The crust was tough while the cold foie inside was very creamy. The textural sensations were on par with the tastes; again, a wide range – the hard crunch of the shell, the ‘softer’ crunch of the brioche, and the creamy foie inside. 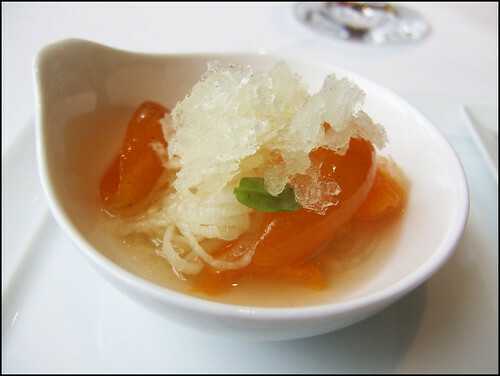 The marmalade gave the dish just enough acidity. Excellent. 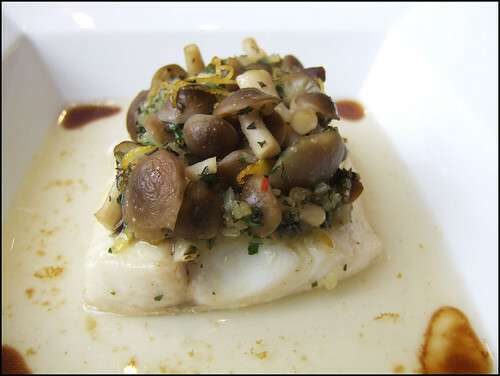 On paper, the Black Cod Steamed with Honsheimeji Mushrooms and Lemongrass Consomme sounded like it could hit that right note of subtleness with me. However, the dish was a bit bland. The fish was slightly over-cooked, preventing the texture from achieving that wonderful black cod silkiness. The lemon zest in the mushrooms perked up but nothing else popped. The lemongrass consomme lacked much flavor, despite being mixed with tomato water. Ok. The Crispy Arctic Char, Miso-Potato Puree, and Granny Smith-Jalapeno Juice was a fantastic concept with some execution issues. 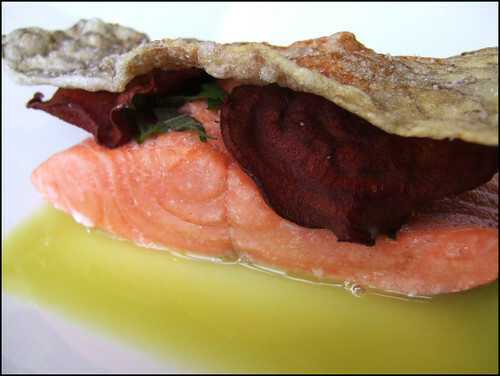 Texture was front and center – crisped skin, the red chips, the fish, and the puree. The fish was not cooked correctly – the outside was overcooked while the inside was raw. Regardless, the taste sensations reminded one of the earlier dishes – upfront jalapeno and miso that gave way to the fish and apple. Good. 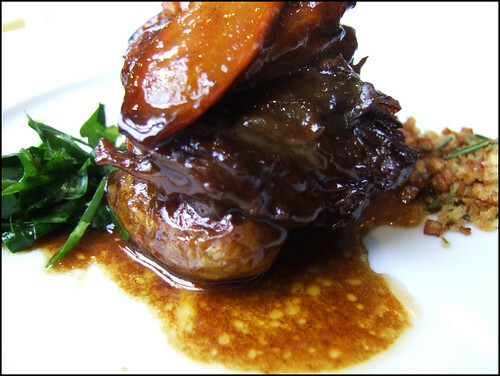 The Tangy Glazed Short Ribs, Crunchy Grits, and Herb Salad, no fault of the restaurant, were too much – I was full. The glaze was quite sweet but the herb salad was powerfully acidic and did a great job balancing out the richness of the ribs. 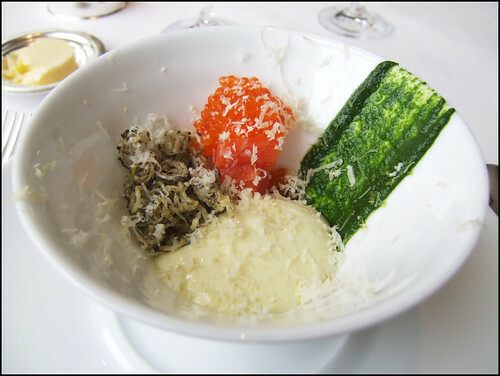 The crunchy grits fulfilled the textural obligations of a Jean Georges dish. There were a lot of desserts and I didn’t keep notes. However, I thought they were very good overall. 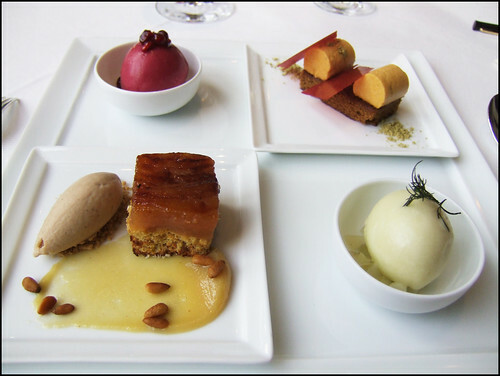 They blended effortlessly into the meal – a sweet continuation of the savory courses. 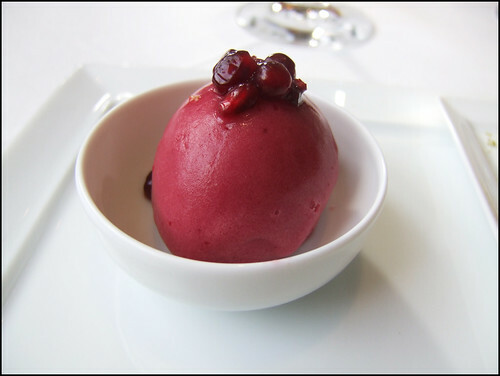 There were big tastes – tamarind ice cream and apple/dill sorbet – and textures – jicama noodles. I would probably order one less dish next time so I could enjoy dessert more. Overall, I had a very enjoyable lunch. This time, I enjoyed the in-your-face flavors, so much that I missed them in the cod dish. For the price, I think every food lover should try Jean Georges for lunch. Jean George’s dining empire spans the globe, and much of his cuisine is ubiquitous, but the flagship restaurant offers a worthwhile experience. 1 – This meal cost $149 with a $70 bottle of wine. That is a remarkable value. 2 – It is also worth nothing that I have the special asterisk next to my name in their computer. That symbol may, or may not, account for the quality of the meal. The cuisine of Jean-Georges Vongerichten is more acrobatic than it was a quarter-century ago, when he brought unprecedented inspiration to even the simplest food. (Chickpea fries! Pea pancakes! Beet tartare!) Diners trembled. Critics knelt. Times changed, and as his recipes became more complex and his restaurants more numerous, not everything seemed quite so insightful. I always considered the flagship, Jean Georges, a very good restaurant, never a great one. The service has always been perfect, just effusive enough. The small dining room is soft, curvaceous and pleasant, the huge windows more essential to the ambience than any of the decorative touches. To me the dishes there were a often little too fussy, a bit too sweet, the Asian influences Vongerichten championed a touch out of control. Still, my evaluation of him as a chef never changed—to me he is the greatest chef ever to work in America. I always hoped for better at Jean Georges, and recently I got it, easily the best meal I've had there this century. Every dish at a lengthy lunch for four was impressive, exactly what high-end dining should be, and at least half of them went far beyond that. These were expressive, startling, full of surprises. I have always loved fish in broth, and the crusted black bass comes in a broth only this particular chef could conceive, one with mushrooms, soy, herbs, citrus, honey, maybe more, all in astounding harmony. Raw scallop slices set on rice cakes possessed implausible intensity—that's the old Jean-Georges the world worshipped. There was a gorgeous variation on his legendary tuna-avocado-ginger combination, the tuna arriving in ribbons, sort of fishy fettuccine. 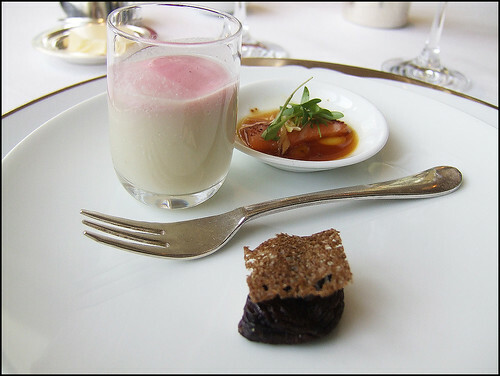 Foie gras was served with granola, in a tiny bowl—who says duck liver isn't for breakfast? Shrimp was paired ridiculously well with Japanese squash. It was a majestic meal, one no other chef on earth could have envisioned. I suspect few people feel about Vongerichten quite as I do, distressed when he's not perfect, thrilled when he is.